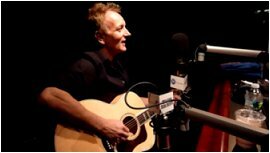 Def Leppard guitarist Phil Collen performed two live acoustic songs on the VH1 Classic Rock Nights radio show in New York last night. Phil played a short version of 'Hysteria' and MANRAZE album track 'All I Wanna Do' as well as being interviewed by host Eddie Webb. Phil talked about the MANRAZE album and tour plans, classic Def Leppard music, making mistakes whilst playing live. He mentioned a few newsworthy things without going into too much detail. He did say that Def Leppard have one tour date confirmed so far (possibly in May as he indicated a few weeks back). A gallery of pics has been added to the show page and you can watch a HD video of the 'Hysteria' performance on facebook. Joe's doing the Titans Of Rock? "Yeah. In fact, I didn't even know Joe was doing it. He said, 'oh they've asked me to come down and do this thing...' so I think South America, I think and it's all people from different bands. I don't really know the exact set up but it sounds like fun." "We are. We're waiting for the Def Leppard tour to get finalised. So we're going out in the summer. There's one date up already - we saw that online somewhere. So that's the only one there so far. We're gonna be with Poison and that's all we know, we haven't even got a starting date. So as soon as we've got that locked in then we can figure out the MANRAZE tour dates."